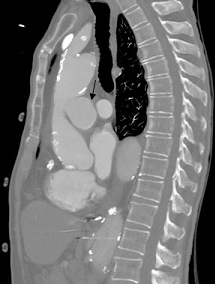 Aortic Pseudoaneurysm is a rare, although well recognized complication following cardiac or thoracic surgery. 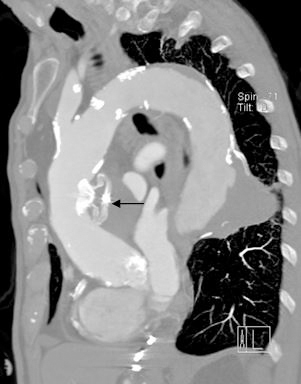 Herein, we describe a unique case of spontaneous Pseudoaneurysm of ascending aorta measuring 38 x 32 x 41 mm in an 83 year old male who presented with near-syncopal episodes and was successfully closed percutaneously using the Amplatzer Atrial Septal Device Occluder. Post procedure Transesophageal Echocardiogram showed presence of the device across the neck of the Pseudoaneurysm with no significant color flow into the Pseudoaneurysm sac. Follow up CT angiogram showed a completely thrombosed Pseudoaneurysm. A 83-year-old male was brought to the hospital by his wife for multiple near-syncopal episodes. His prior history included severe COPD, MI in 2006 with bare metal stent in Right Coronary Artery, moderate Aortic Stenosis (AS), aneurysmal disease involving intracranial vessels, severe ectatic aortic arch and type 3 features along with atherosclerotic disease of the great vessels. He denied having any chest pain, shortness of breath or palpitations prior to these episodes. He had no obstructive carotid artery stenosis by duplex scan and had had no previous cardiac or thoracic surgery. According to his wife, he had significant frailty and required assistance with daily activities. His physical exam revealed an ejection systolic murmur consistent with aortic stenosis. There was no significant difference in blood pressure between arms. ECG on admission revealed sinus bradycardia with an old inferior infarct and left axis deviation along with left atrial enlargement. Chest Xray showed a left hilar mass that was partially superimposed over ectatic descending aorta. CT angiogram (CTA; Figures 1 and 2) was done that revealed a large contained Pseudoaneurysm of the medial aspect of the ascending aortic arch measuring 38x32x41mm with severe compression of the main pulmonary artery and right pulmonary artery branch with features of impending rupture. The Pseudoaneurysm was noted to be at least 50-mm at its maximum diameter and was partially thrombosed. There was also a descending aortic aneurysm with acutely protruding lateral wall with evidence of thrombus at base. There was no evidence of aortopulmonary fistula although there was some abnormality at the right pulmonary artery branch suggestive of a small and stable Pseudoaneurysm. Figure 1. CT Angiogram. 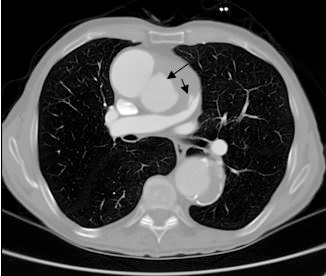 Bigger arrow showing large pseudoaneurysm with laminated thrombus; smaller arrow showing small isolated pseudoaneurysm of left pulmonary artery. Figure 2. CT Angiogram. Arrow showing large pseudoaneurysm with laminated thrombus. Coronary angiography was done that showed a widely patent right coronary stent and chronic moderate disease in the distal RCA in the range of 50%. There was moderate to heavy calcification in the mid segment of LAD with chronic sequential 60 to 70% narrowing. Transthoracic Echocardiography (TTE) showed preserved LV function, and calcified degenerative moderate aortic stenosis and pulmonary hypertension. Given his age, severe frailty, presence of significant morbidities and prohibitive risk of surgery, a decision was made to use the 26 mm Amplatzer Atrial Septal Device occluder (St. Jude Medical, St. Paul, MN) to close the Pseudoaneurysm percutaneously through the right brachial artery. A 0.035 in Versacore wire was used to access the Pseudoaneurysm sac following which a 6-French pigtail catheter was advanced successfully into the sac. Keeping the catheter as well as 0.035 in guidewire as a unit, the delivery sheath was then advanced without much difficulty into the mid portion of the Pseudoaneurysm sac. The 26-mm ASD occluder device was then successfully inserted into the Pseudoaneurysm sac with deployment of both discs. By TTE, there was no evidence of any significant flow into the Pseudoaneurysm sac. Post-procedure TTE 3 days after the procedure (Figure 3) showed the device to be in place without any significant flow in the Pseudoaneurysm sac. The descending aortic aneurysm was not intervened upon as it was felt to be less likely to rupture in the immediate future. Repeat CT angiogram (Figures 4 and 5) of chest 1.5 months post-procedure showed presence of an occluding device across the neck of the aneurysm. Three months post-procedure, he complained of reflux symptoms and weight loss, although did not have near- syncopal episodes. Figure 3. Transthoracic Echocardiography. Arrow showing ASD closure device in the wall of the ascending aorta. Figure 4. CT Angiogram. 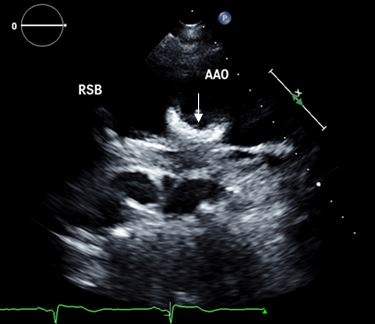 Bigger arrow showing ASD closure device with thrombosed pseudoaneurysm; smaller arrow showing persistent isolated pseudoaneurysm of left pulmonary artery. Figure 5. CT Angiogram. Arrow showing ASD closure device with thrombosed pseudoaneurysm. 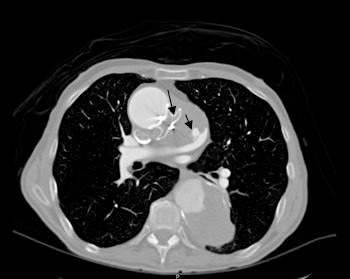 Pseudoaneurysm of the ascending aorta is a well-recognized although infrequent and high risk complication that is usually seen after cardiothoracic surgery. Recent advancements in imaging techniques have made it convenient to visualize the location, origin, dimension, extension and anatomy surrounding the pseudoaneurysm with good precision. The pathology behind Pseudoaneurysm includes weakness of either layer of the arterial/aortic wall, resulting in disruption of the layers of the wall of the aorta and is covered by the remaining vessel wall layers and/or the surrounding structures. The onset of clinical symptoms often varies and may present shortly after surgery or after an asymptomatic period of months or years or maybe even in the absence of surgery as described in our case. The presentation is varied and diagnosis can be confirmed by CT, MRI or by TTE. Treatment is recommended in all cases regardless of whether the patient is symptomatic. A mortality of 61% has been reported if the patient remains untreated (Mulder, 1998). However, surgical management is usually associated with high morbidity and mortality rates, with reports ranging from 7.6% up to 60% [1,2]. These high rates mostly result from rupture of the Pseudoaneurysm leading to fatal hemorrhage. Prior endovascular approaches such as coil embolization  and thrombin injection  were used in patients with significant co-morbidities without optimal outcomes. Different types of percutaneous devices have been used infrequently as an off- label indication for the occlusion of Pseudoaneurysms [5,6]. Use of Amplatzer ASD occluder device is a novel technique and long term follow up experience up to 2 years have shown promising results . The exact cause of his dizziness was unknown and it was felt to be secondary to his underlying moderate AS along with compression of pulmonary structures with or without contribution by the Pseudoaneurysm. Use of these devices is increasingly common as an alternative to surgery not only for Pseudoaneurysms but also for complications of other procedures . While deployment of the device is simple and relatively safe for patients who are poor surgical candidates, continued surveillance for complications [9,10] is essential given lack of adequate experience with long term use of these devices. ©2015 Selvaraj V. This is an open-access article distributed under the terms of the Creative Commons Attribution License, which permits unrestricted use, distribution, and reproduction in any medium, provided the original author and source are credited. Baystate Medical Center, Springfield, MA 01199, USA, Tel: 413-271-0421, Fax: 413-794-0198.